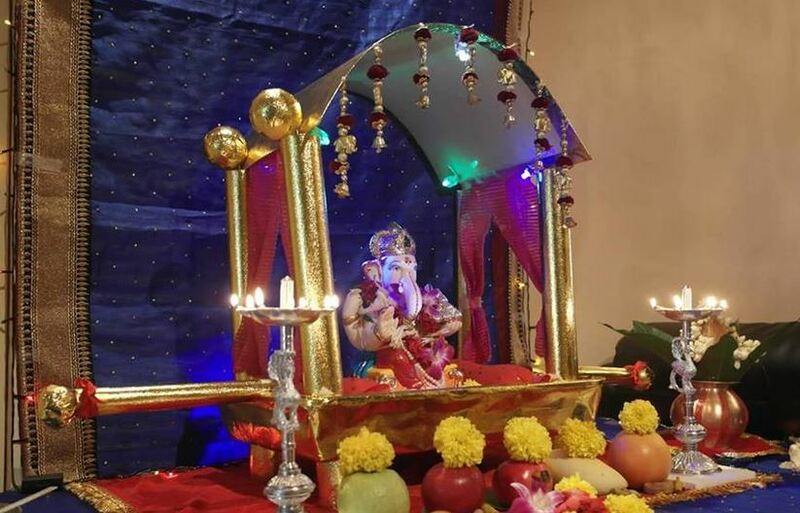 Get pretty creative Ganpati decoration ideas. Use different decor ideas this festive season. 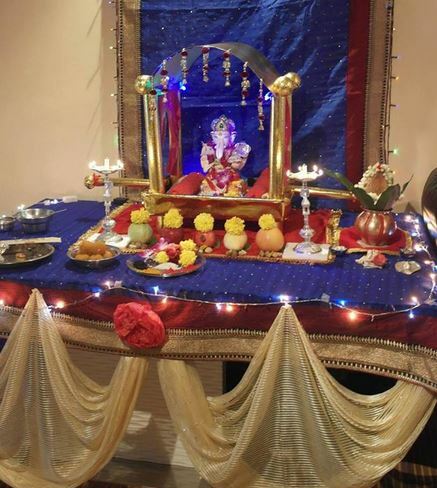 Use these decoration ideas and tips during other festivals like Diwali, Janmashtami, Dusehra or Sarswati pooja. 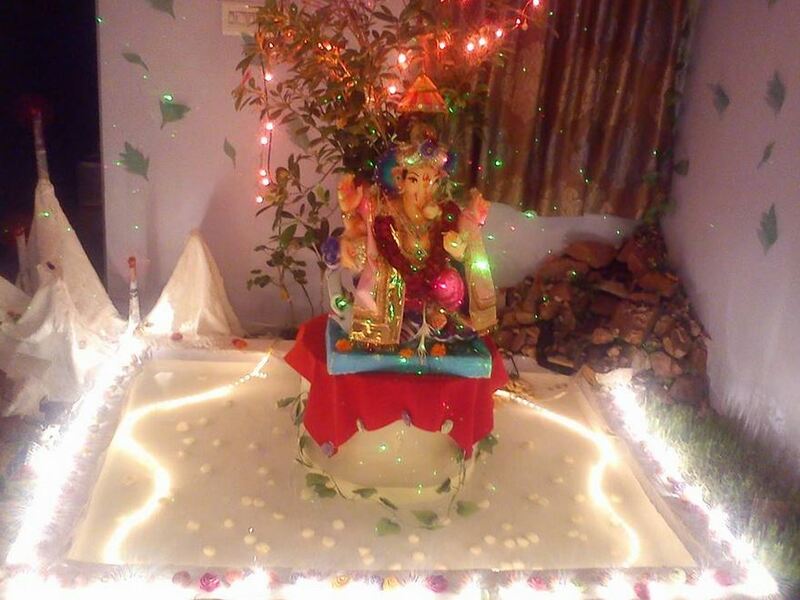 Place your Ganpati in a small artificial pond set-up. Place bricks in square shape and cover it with a POP sheet. Add pebbles and lighting to it. Decorate the edge with mountains, flowers and plants. 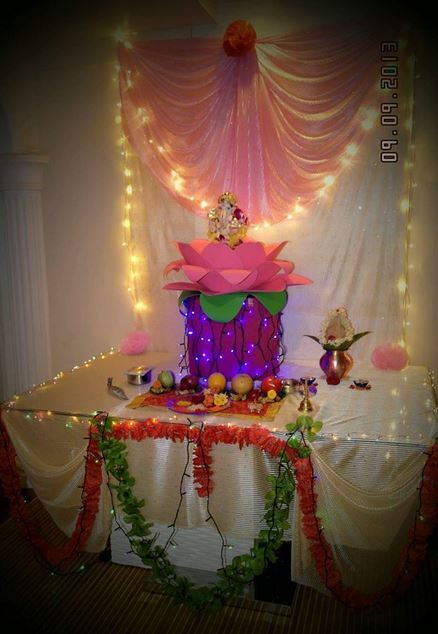 Make a lotus using paper or fabric. Place it in the center and decorate the room with flowers. Make a round platform, cover it with white fabric and flowers. Light the pedestal from below to get this effect. Hang beads and crystals. 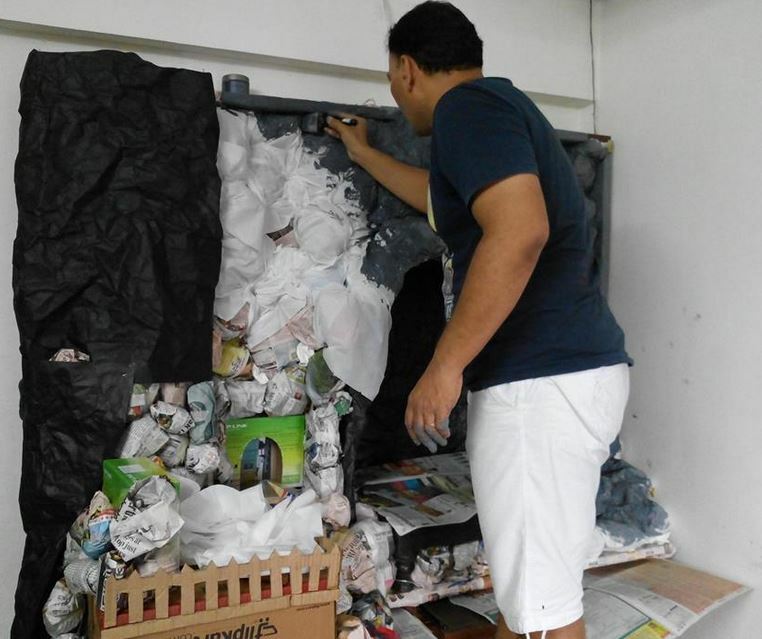 Use newspaper to make birds. 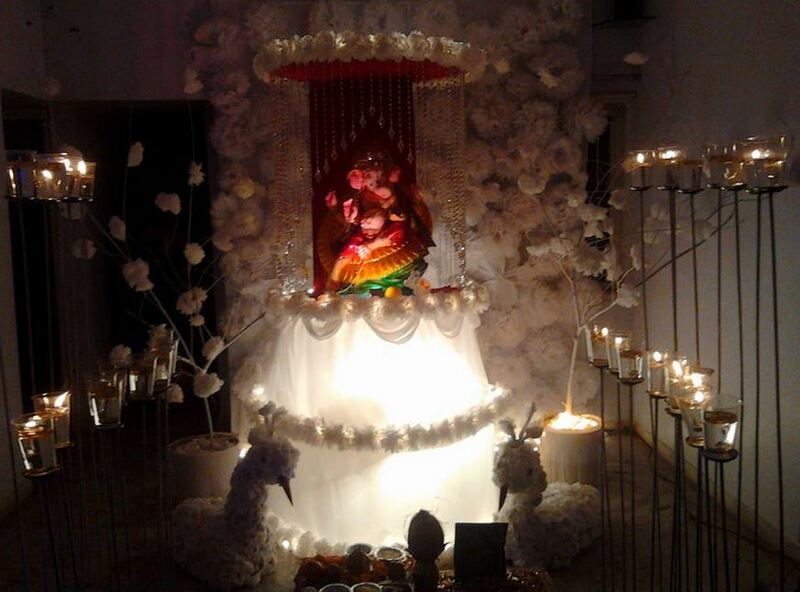 Arrange candles on either side of the idol. Make a palna with cardboard and golden paper. 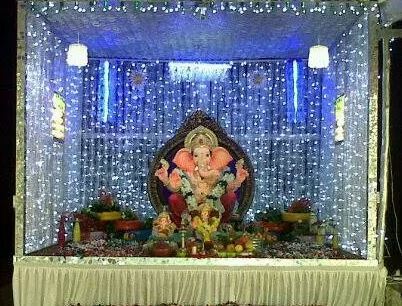 Hang a lights and a nice saree in the background. 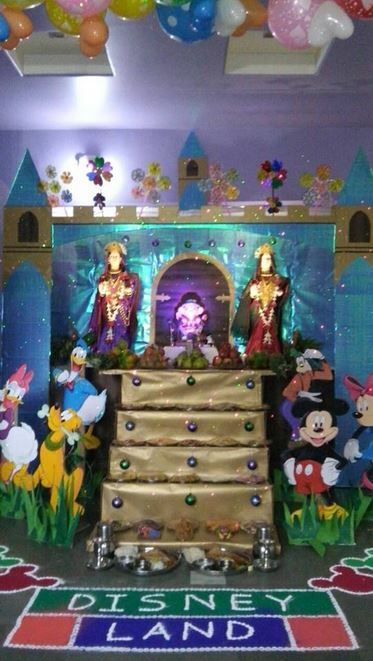 Here is a Disney theme Ganpati decoration. Build a castle, decorate the wall with balloons. Add characters like Donald Duck, Goofy, Pluto, Mickey and Minnie Mouse. 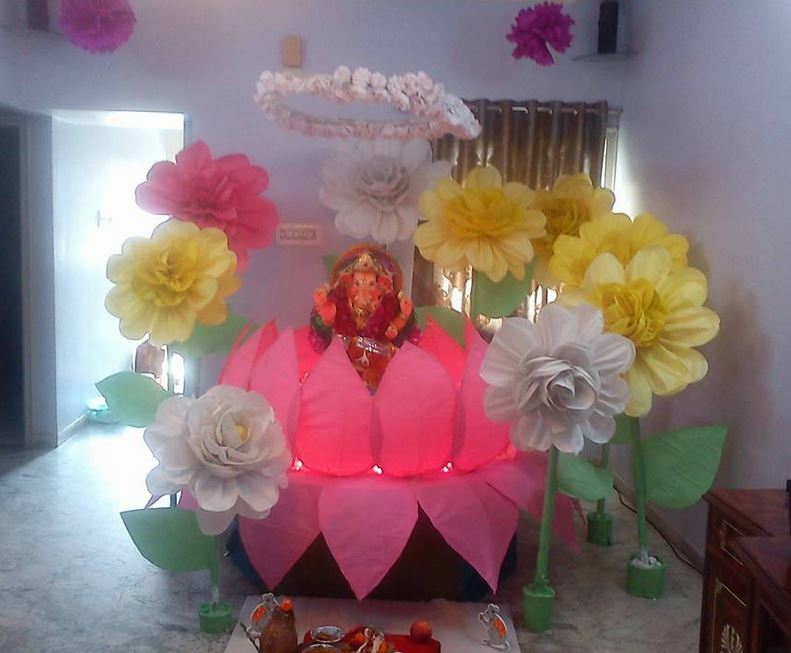 Prepare a Lotus flower at using paper craft ideas and place Ganpati Bappa in it. 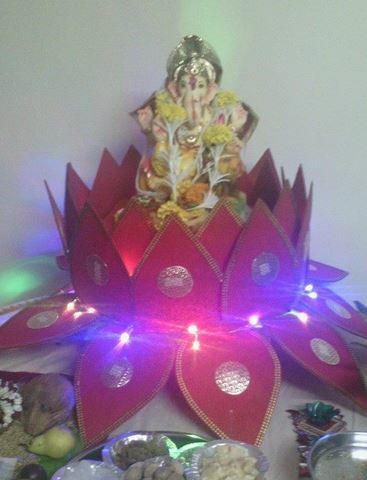 Decorate the Lotus with lace and lights. 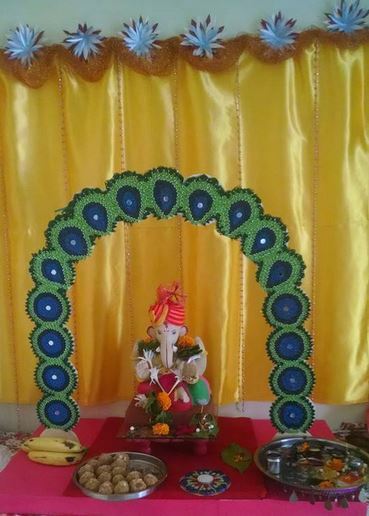 Use saree and stoles to do up your Ganesh Chaturthi decoration at home. Hang paper streamers and plants to add beauty to it. 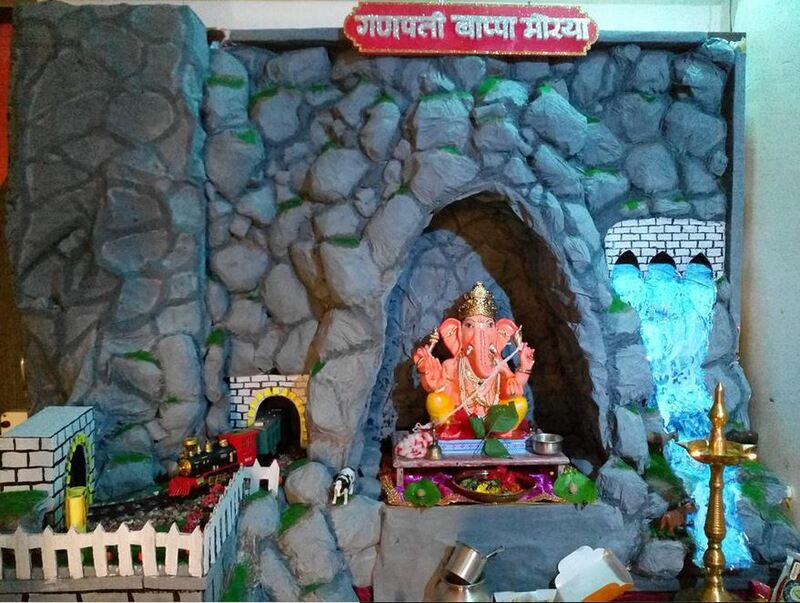 Old bottles have been used to build up this pretty mandap for lord Ganpati. Color old tyres and place them at the back. Decorate it by adding plants on it. 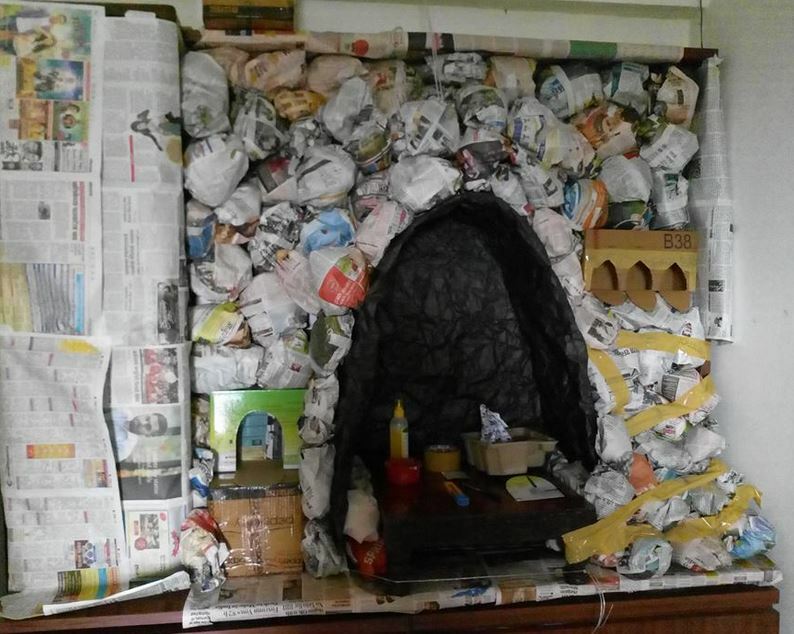 Use old CD’s to create the arch. Then paste paper quills on the CD; add white pearls on it to create this look. Hand a yellow satin curtain in the background. 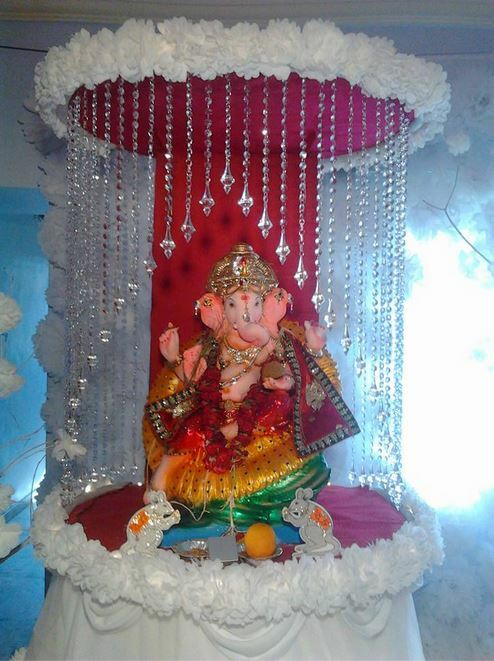 Use newspaper, tissue paper and cardboard boxes to create this mesmerizing landscape decoration for Ganpati. Paint it up with poster & acrylic colors to get the final look. 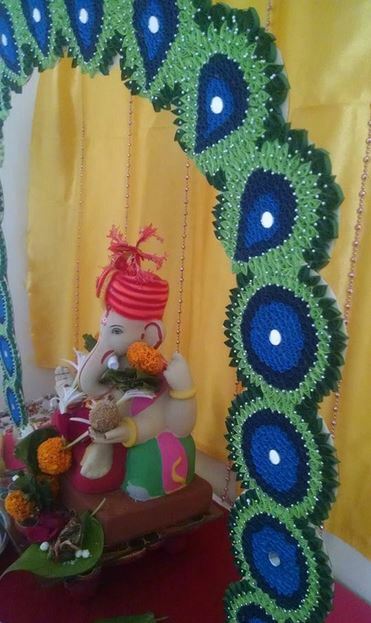 This entry was posted in Pooja Room, Pooja Room Designs and tagged Decoration Ideas for Ganpati, Ganesh Chaturthi Decoration, Ganesh Chaturthi Decoration at Home, Ganesh Chaturthi Decoration Ideas, Ganesh Chaturthi Decoration Ideas at Home, Ganesh Chaturthi Decoration Ideas for Home, Ganesh Chaturthi Decoration Ideas Images, Ganesh Chaturthi Decoration Ideas Pictures, Ganesh Chaturthi Photos, Ganesh Chaturthi Rangoli Designs, Ganesh Decoration, Ganesh Decoration at Home, Ganesh Decoration Crafts, Ganesh Decoration Ideas, Ganesh Decoration Images, Ganesh Decoration Pictures, Ganesh Decoration Themes, Ganpati Decoration, Ganpati Decoration at Home, Ganpati Decoration at Home Photos, Ganpati Decoration Craft Ideas, Ganpati Decoration Design Pattern, Ganpati Decoration Ideas, Ganpati Decoration Ideas at Home, Ganpati Decoration Ideas at Home Images, Ganpati Decoration Ideas at Home Pictures, Ganpati Decoration Ideas for Home, Ganpati Decoration Ideas for Home Ganpati, Ganpati Decoration Ideas with Theme, Ganpati Decoration Images, Ganpati Decoration Makhar, Ganpati Decoration Pictures, Ganpati Decoration Themes, Homemade Ganesh Decoration, How to Make Ganpati Decoration at Home, Ideas for Ganpati Decoration at Home, Pooja Room Decoration for Ganesh Chaturthi, Simple Ganesh Chaturthi Decoration Ideas, Simple Ganesh Decoration at Home, Simple Ganpati Decoration at Home, Thermocol Ganpati Decoration at Home by Homemakeover. Bookmark the permalink.